Mobile.Android\Resources\values\styles.xml(2,0): Error APT0000: Error retrieving parent for item: No resource found that matches the given name 'Theme.AppCompat.Light.DarkActionBar'. Mobile.Android\Resources\values\styles.xml(2,0): Error APT0000: No resource found that matches the given name: attr 'colorAccent'. Mobile.Android\Resources\values\styles.xml(2,0): Error APT0000: No resource found that matches the given name: attr 'colorPrimary'. Mobile.Android\Resources\values\styles.xml(2,0): Error APT0000: No resource found that matches the given name: attr 'colorPrimaryDark'. Mobile.Android\Resources\values\styles.xml(2,0): Error APT0000: No resource found that matches the given name: attr 'windowActionBar'. Mobile.Android\Resources\values\styles.xml(2,0): Error APT0000: No resource found that matches the given name: attr 'windowActionModeOverlay'. Mobile.Android\Resources\values\styles.xml(2,0): Error APT0000: No resource found that matches the given name: attr 'windowNoTitle'. Mobile.Android\Resources\values\styles.xml(2,0): Error APT0000: Error retrieving parent for item: No resource found that matches the given name 'Theme.AppCompat.Light.Dialog'. Mobile.Android\Resources\values\styles.xml(2,0): Error APT0000: Error retrieving parent for item: No resource found that matches the given name 'Theme.AppCompat.Light'. Mobile.Android\Resources\values\styles.xml(2,0): Error APT0000: Error retrieving parent for item: No resource found that matches the given name 'Theme.AppCompat.Light.NoActionBar'. We recently moved from Xamarin.iOS and Xamarin.Android UI to Xamarin.Forms UI. The build agent is able to build the previous builds successfully. The app builds successfully on our local dev machines (tried on 2 different) in release mode. Also tried building the code by simply downloading the app on Build Server and running via VS and it build successfully. Xamarin.Android.Support.v7 and Xamarin.Android.Support.v4 are included. Making sure the shared code builds before android code. Updated the Android SDKs on Build Server. Android config is same as on my dev machine. Been struggling with this for 2 days now. ANy help will be much appreciated. Following is the YAML config that helped me finally build the project. I was running dotnet restore on the solution in previous pipeline before running MSBuild which I am not doing here. I was building the solution before while here I am building android csproj. IMO, sln should build because the in release config of android, I've set it to only build with android and shared projects. Clean in all steps was set to be true, absence of which was causing a different issue TaskABI not found. In previous pipeline, I was running NuGetInstaller against what I am doing now which is NuGetTollInstaller and then just running nuget restore on it. So I am still not 100% sure what I was doing wrong but my best guess would be that nuget restore was either not working properly or clean in next steps was cleaning the nuget. If someone wants to investigate further, most welcome. I'll post definite answer if I figure it out but for not this yaml is working. please add a diagnostic build output about this issue. (As a file attachment or gist link), that would be really appreciated! Just as the follows. @jezh Thanks for the suggestion. I solved it though. I dumped the old pipeline and created a new pipeline by writing a new yaml. Somehow, even when I was creating new pipeline using UI, ti was still failing. I created a new config in CLI. I will post the file as answer soon. @jezh- I'm getting the same error too now. The Agent from Azure DevOps runs on the same machine as I develop on. 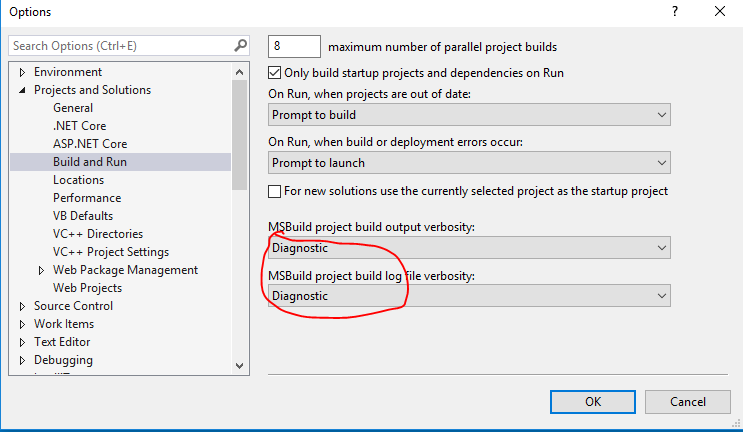 I can compile with VS2017 without error, but I get @NitishKumarSharma error when the Agent tried to build. The Agent building on a Mac, works fine. What info so you need from me?